CAMP HILL, Pa. — The way Ted Williams sees it, an element of surprise can be a wonderful thing. As vice president of general merchandise and seasonal at Rite Aid Corp., Williams strives daily with his category management team to meet customers’ shopping needs and — whenever possible — to provide a touch of the unexpected that can turn a trip to the store into something special. For his leadership role, Williams has been named by MMR as one of Six Executives Who Made a Difference in 2017. That philosophy dovetails with Rite Aid’s successful Wellness format, which offers an expanded selection of health- and wellness-oriented products and now accounts for more than half of the retailer’s store locations. While at first glance GM and seasonal’s place in a “wellness” concept might not be obvious, Williams notes that it depends on how broadly you define well-being. Rite Aid’s Wellness concept, in fact, emerged not long after Williams joined the company. He came to the drug chain in October 2008 working as a consultant for several months before joining the company officially in January 2009. “I served as a business consultant, which was a great way to get introduced to the company and understand the Rite Aid culture,” Williams says. He came to Rite Aid from Pathmark Stores Inc., where most recently he served as vice president of nonfoods and pharmacy. 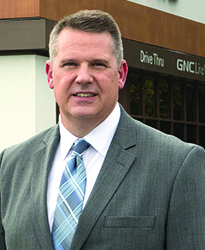 He joined Pathmark in 2005 as director of nonfoods sales and merchandising. Prior to that, he was a divisional merchandise manager at CVS Pharmacy. To make Rite Aid’s GM and seasonal offerings stand out, Williams says that he and his team try to put themselves in the customers’ shoes. Product placement and presentation also reflect the ways that customers in a given store shop, according to Williams. Williams’ category management team for GM and seasonal includes five category managers and one import director, who report directly to him. Each category manager has an associate category manager, and the import director is assisted by a manager. Williams also couldn’t overstate the importance of close collaboration with supplier partners — especially given the huge variety of available products in the GM and seasonal area. “It’s critical, being that my categories are fairly diverse. When you think about working with a major household chemical, laundry or paper company, it’s much like health and beauty care — being collaborative and trying to figure out how you can create differentiation when everyone else has the same product in the same type of shelf space,” he explains. Williams says Rite Aid helps him and his team do their jobs better by fostering a collaborative spirit and a willingness to share new ideas, which he describes as a “partnership” between the company and its ­employees.